Hi all, here's a concept sketch of the main protagonist in an eComic I am working on. He's a forest warrior based upon a reference photo. Painted in Manga Studio with a Wacom Intuos3 tablet. Any critiques would be appreciated. A full length concept of Sylen Benevolen for my eComic. I've had to redraw his legs 4 times so far! These are nice, there's a solidity to them that bodes well for your finishes. Use more ref. A walking pose shouldn't take three hours, nor is it necessary to note that on an unfinished piece. I've seen digital artists note the length of time it took them to complete a thing because whatever they've done is so amazing that folks keep asking 'how long did that take?' but no one cares if it isn't good. I visited your website and I think it's wonderful that you're breaking down your time in an organized way but I see that your projections are radically different than your actual time spent drawing; something isn't working. Your work ethic isn't the issue. Focus now on improving your craft before getting too hung up on how long things take. That will come. Nice constructive thinking on the colored piece; it looks referenced more than the sketch. Did you paint over a photo? That's good practice as well. Last edited by MattTriano; 08-16-2015 at 09:53 AM. Hey thanks for taking the time to give some feedback Matt, very much appreciated . I scribble-in the time taken as a note to myself to help me plan my work and you are correct - something isn't working. I'm hoping I'll speed up a bit as I get into the flow. The full length sketch is patched together from about 4 different reference photos with a bit of my own interpolation added in. Unfortunately the main anatomical reference didn't show the legs very well so I had to check my own legs out in a mirror (sounds narcissistic but I did it in the name of art ). I guess I'm not too good at choosing references yet. The completed head painting was copied from a single reference - I haven't tried painting over photos yet but I might try that as a training exercise, thanks. I scribble-in the time...I'm hoping I'll speed up a bit as I get into the flow. It takes mastery to know how to shave off time, how to hurry a thing without killing it completely, how to fake as convincingly as if you'd used ref. Note it for yourself perhaps as a record of growth but in my experience no amount of external pressure can make you a better artist, the work takes time. Especially on a personal project. And again, no one cares if they aren't asking. The full length sketch is patched together from about 4 different reference photos with a bit of my own interpolation added in. Unfortunately the main anatomical reference didn't show the legs very well so I had to check my own legs out in a mirror (sounds narcissistic but I did it in the name of art. I guess I'm not too good at choosing references yet. Too much. Google it, visit stock photo sites, check out art ref apps for your phone (I like one called Handy) and take photos of yourself. Download a timer camera app or simply take video of yourself acting things out; in either case, set up your phone or camera from the perspective of the reader. If you have a webcam that can be helpful as well. Always take several photos of different types of poses. Play around. Use props. Don't be shy, don't worry if you don't look like your characters because the goal is to find the weight of the figure, the gesture and basic forms. It isn't narcissistic, it's professional. Get the work done by any means, so long as they're ethical. Finally finished Sylen Benevolen 2. I'd be grateful for any critiques and areas for improvement. Thanks. Also, you can use for an example, Poser or Manga Studio (ClipStudioPaintPro) software, where you have very nice 3d models. those are the things that stand out when I first look at it, otherwise I think it looks fine. Hey thanks for the feedback guys, appreciate it. @Metalni: I recently bought Manga Studio so I will investigate the 3D models, thanks. @jasondego: Yep, I can see what you mean about the nose and legs, thanks for taking the time. Great advice here already. Looking forward to your new pics. @DanielPicci: Thanks for taking the time dude. 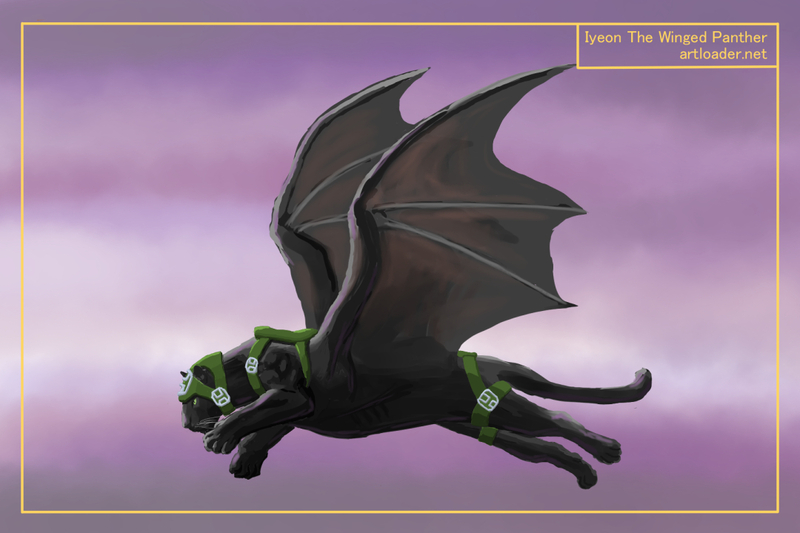 Here's a winged panther concept. I've changed my art process for this, skipped the line drawing stage completely and went straight to digital painting. Any critiques appreciated. I needed to practice some environments so here's a dark temple concept. The setting is on an alien world where there are planetary rings in the sky. Not sure the dark temple looks like a dark temple though and I'm not very happy with the cliff in the foreground. Any advice or critique would be gratefully received - thanks. nice paints!! Everything is purple and green. Heheh thanks mate, yeah my fictional world has a purple sky and purple oceans - possibly too much purple but we'll see.